What Falcons fans need to know as Air Force hosts the Nevada Wolf Pack for the first time … under the Friday night lights. Who, where, when: Nevada (6-2, 3-1 Mountain West Conference) at Air Force (4-3, 3-1 MWC), tonight, 6 p.m. Mountain time (8 p.m. Eastern). TV: CBS Sports Network (Brad Johansen and Doug Chapman have the call). Gambling is illegal in most states (but not Nevada): Nevada is a 3.5-point favorite. RB news, Part I: Last week, the Falcons allowed 338 yards rushing to New Mexico’s Kasey Carrier, yet still came away with a victory over the Lobos. Now, on six days’ rest, the Air Force defense must deal with Wolf Pack junior Stefphon Jefferson, whose 156 yards rushing per game leads the nation. Jefferson’s also got 15 rushing touchdowns and has shown remarkable durability, with 251 carries already this season — only one other top-50 rusher has cracked the 200-carry mark. More about Jefferson, including Air Force coach Troy Calhoun’s take on stopping him, here. 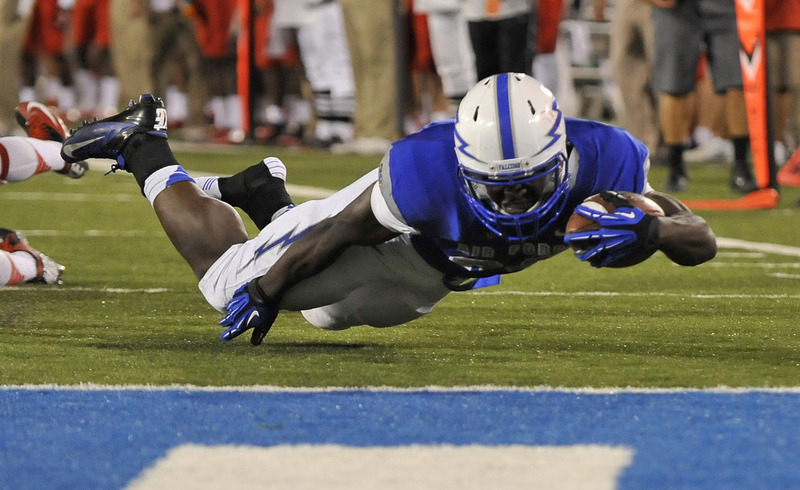 RB news, Part II: Air Force senior Cody Getz’s path to No. 4 spot on the college rushing charts (132.57 ypg) hasn’t been quite as smooth. Getz hurt his ankle two weeks ago against Wyoming, then reinjured it on the first play against UNM on Saturday. He’s either doubtful or questionable tonight, depending on who you ask, and doesn’t appear on the Falcons’ depth chart. Look for Wes Cobb to shoulder the load again this week, supported by sophomore Jon Lee. Don’t forget Dietz: Battling through his own injuries, senior quarterback Connor Dietz has quietly led the Falcons to two straight MWC wins after a disastrous overtime loss at home to Navy. He rushed for 58 yards last week in the win over UNM and went a perfect 4-for-4 throwing the ball. What about that injury? : Yes, Dietz was shaken up during Air Force’s win over Wyoming two weeks back. Accusations were made. Punishments were meted out. Probably not the way either team wanted to end up getting press from this guy. Ways and Means: Air Force senior linebacker Alex Means returned an interception for a touchdown and made a game-clinching fourth-down tackle last week against the Lobos. Read more about him here and here. Pistol power: Any time an offense gets its own New York Times graphic, the system’s creator might be on to something. Nevada head coach Chris Ault developed the pistol, which gets its name from a shorter-than-shotgun-distance snap to the quarterback. So far, so good this season — Nevada’s scored more than 30 points every time out, including a 69-24 demolition of Hawaii on Sept. 22. If Means and Co. can’t figure out the pistol in a hurry, Air Force fans can expect a long Friday night.